An Engan businessman has been arrested and charged over the misappropriation of more than K1.3 million belonging to Ijivitari district, Northern Province. Yesterday, detectives from the National Fraud and Anti-Corruption Directorate (NFACD) arrested managing director for First National Real Estate Ltd, Martin Piason, aged 39 of Tsak village, Wapenamanda. He was charged with one count of misappropriation of more than K1.3 million under the criminal code act and one count of money laundering under proceeds of crime act. In a statement, fraud director Matthew Damaru said it is alleged K3 million was paid by the Ijivitari District Treasury to two companies for purported mobile health programs. “However, the purported health program never materialised despite these payments being made in May 2012,” stated Damaru. 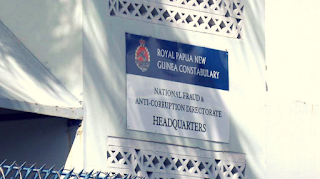 “The National Fraud and Anti-Corruption Directorate conducted investigations into the complaint by Governor Gary Juffa. “The investigations revealed that K3 million was split into two portions of K1.65 million and K1.35 million. “The First National Real Estate Ltd was paid K1,350,000 whilst the other portion was paid to another company. It was alleged that Piason travelled to Popondetta and collected the cheque on May 29, 2012, for K1,350,000. He then returned to Port Moresby and deposited the cheque into his company bank account, in which he was the sole signatory. “Thereafter he withdrew money from the account by writing cheques to companies, certain individuals including himself, and cashed cheques which he personally presented at the bank,” said Damaru. “All these transactions were done in NCD and not Oro. “Piason was interviewed at Konedobu NFACD office and charged with one count of misappropriation of public funds and one count of money laundering. “After the arrest process was completed, he was taken to Boroko Police Station and placed in the cells.